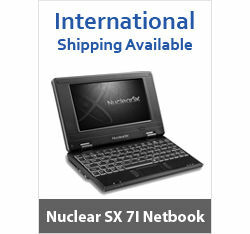 Nuclear Sx 7I Netbook - TVC Skyshop - Buy world-class innovative products at affordable prices offering full value for money. 1) Nuclear SX 7i is a compact 7-inch net book that flaunts its strikingly unique design. Despite its light built and slender look, the net book is rich with features that can easily replace heavy laptops. 2) 7-inch LCD Screen stands for admirable visual clarity. The net book offers crisp images at a striking resolution of 800 x 480 pixels. 3) Dual Core, 1GHz processor in Nuclear SX7i is best suitable for you since it offers improved browser performance as compared to other mini-laptops. Unlike many net books, the processor of this light notebook is powerful enough to run games. 4) Besides having an in-built memory of 2GB, Nuclear SX 7i has an Expandable memory Slot of 32GB with SD/SDHC Card. You don’t fall short of space even after you have downloaded movies, songs, games and photos to your desire. 5) This sophisticated laptop is quite a dependable device, especially if you are on the move. It comes with 6-cell Lithium-Ion battery providing you enough backup. This hi-tech Netbook brings along with it a number of useful accessories for users’ convenience. Besides a fashionable case, charger and USB Mouse, you also get keyboard protector and earphone. Refer to the User Manual to make full use of this notebook. Keep the Warranty Card handy. Made of durable material, this stylish bag has neat stitches to last long. Nuclear SX 7i bag helps you to safeguard your Netbook from any accidental damage. Light padding on all sides makes it both strong and comfortable to wear and carry. Made from high-end technology, the cooling pad protects your Netbook from overheating. It is very light weight, works with a great speed and very easy to use and operate. Designed to produce superior quality sound. Very convenient and easy to wear earphones. Now keep your keyboard safe and clean without affecting the computing experience, the laptop keyboard protector is a more of a necessity today than an accessory. The completely transparent keyboard protector is easy to clean and also keeps your fingers off the bacteria and will prevent the liquid spattering. A perfect addition to your computer table with unique style and functionality. It includes a USB port for easy connectivity and makes an ideal accessory for laptops and desktops. The combo pack is light in weight, offering easy portability. 1) Nuclear SX 7i is a compact 7-inch net book that flaunts its strikingly unique design. Despite its light built and slender look, the net book is rich with features that can easily replace heavy laptops. 2) 7-inch LCD Screen stands for admirable visual clarity. The net book offers crisp images at a striking resolution of 800 x 480 pixels. 3) Dual Core, 1GHz processor in Nuclear SX7i is best suitable for you since it offers improved browser performance as compared to other mini-laptops. Unlike many net books, the processor of this light notebook is powerful enough to run games. 4) Besides having an in-built memory of 2GB, Nuclear SX 7i has an Expandable memory Slot of 32GB with SD/SDHC Card. You don’t fall short of space even after you have downloaded movies, songs, games and photos to your desire. 5) This sophisticated laptop is quite a dependable device, especially if you are on the move. It comes with 6-cell Lithium-Ion battery providing you enough backup. Free Accessories – This hi-tech Netbook brings along with it a number of useful accessories for users’ convenience. Besides a fashionable case, charger and USB Mouse, you also get keyboard protector and earphone. Refer to the User Manual to make full use of this notebook. Keep the Warranty Card handy. Carry Bag:- Made of durable material, this stylish bag has neat stitches to last long. Nuclear SX 7i bag helps you to safeguard your Netbook from any accidental damage. Light padding on all sides makes it both strong and comfortable to wear and carry. Cooling Pad:- Made from high-end technology, the cooling pad protects your Netbook from overheating. It is very light weight, works with a great speed and very easy to use and operate. Earphones :- Designed to produce superior quality sound. Very convenient and easy to wear earphones. Keyboard Protector:- Now keep your keyboard safe and clean without affecting the computing experience, the laptop keyboard protector is a more of a necessity today than an accessory. The completely transparent keyboard protector is easy to clean and also keeps your fingers off the bacteria and will prevent the liquid spattering. Mouse & Mouse Pad:- A perfect addition to your computer table with unique style and functionality. It includes a USB port for easy connectivity and makes an ideal accessory for laptops and desktops. The combo pack is light in weight, offering easy portability. Warranty: 6 Months.